“This is an hard saying; who can hear it?” (John 6:60). We notice a similar statement by Laman and Lemuel when asked to go back to Jerusalem and get the plates from Laban. So, what makes it hard? We know from Matthew 11:30 that the yoke of Christ is easy and His burden is light. Yet we consistently hear people preach from the pulpit how this life is meant to be hard or that we must do hard things. Most people understand that sudden strenuous physical exercise while living a sedentary lifestyle initially feels difficult. As we continue to exercise we start to label our workouts as a hard run, easy run, or a recovery day (for example). This type of cycling through workouts is designed to develop muscular strength and endurance that eventually causes the workout that once seemed hard to be relatively easy. So, why do we often label spiritual things as hard? In most cases I doubt that they are they physically hard. So, what could it be? Perhaps it is it that our spirits are so out of shape that we feel the pain of initial use similar to what you would experience when a atrophied muscle is stressed. This idea of spiritual atrophy was mentioned in a talk by President Hinckley. To avoid this spiritual atrophy we need to exercise our spiritual muscles. Elder Quentin L. Cook gave us this advice. Have we turned our personal spirituality into a spectator sport? 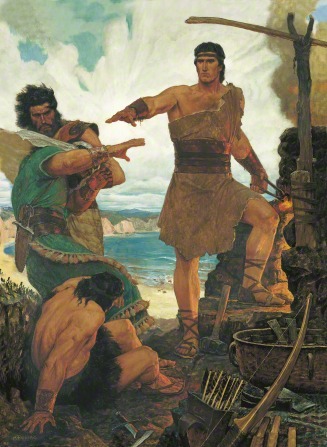 Do we, like Monday morning quarterbacks, marvel at the demonstration of spiritual power during general conference by spiritual superstars and then go back to our old habits? Spiritual sloth won't lead for spiritual power. There will be no reserve of strength when the real spiritual trials come. Without the kind of strength that comes from consistent personal spiritual preparation, even the smallest trials will seem to be a "hard thing".